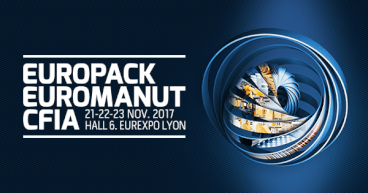 Omron will be at the EuroPack-EuroManut-CFIA event in Lyon, from 21-23 November, demonstrating how it can create smart, flexible production facilities that help customers stay competitive and prepare for the future. The system on show at the Omron stand (Hall 6, stand H76-I75) combines different applicative demos and uses ‘smart’ data to deliver tailored production efficiency to meet actual demand. The specific products on show at the stand include a Quattro robot for pick-and-place applications, two mobile robots (LD60s), a high speed vision system, and a Sysmac Machine Controller. More importantly, all of them are connected via the cloud to deliver a complete, integrated, smart solution. This solution is just one example of Omron's ‘i-Automation’ concept which aims to provide customers with intelligent, integrated and interactive solutions that support Industry 4.0 by enhancing the digitalization of manufacturing. The Quattro robot is a four-axis parallel robot that achieves high speed and high precision for pick-and-place applications. Combined with the vision system, it enables highly accurate pick-and-place control to deliver high speed action, even when moving delicate objects. In addition to speeding production and reducing energy usage, the vision system also contributes to food insurance as it can quickly identify damaged goods, wrong / missing information on labels, or production issues. This allows only the affected batches to be pulled without having to perform expensive recalls. The mobile robots help improve health and safety for human operators by transporting heavy loads between stations. The complete system is controlled by a Sysmac control system that manages the processes and secure communication via the cloud. Bringing together professionals from three sectors, process, packaging, and handling, EUROPACK EUROMANUT CFIA has rapidly become a key industry event. Now in its third year, the event will be host to 500 exhibitors and 12,000 visitors.